Homeowners of septic tanks or sewage treatment plants often find the out flow enters a drainage fields most commonly known as a soakaway. There are many factors to consider form existing drainage field complying to current regulations, constructing new drainage field from site assessment, and general maintenance for the upkeep of your drainage field. Below we have put some information together on constructing new drainage field and how our services can be of help to you. Typical drainage field design consists of sub-surface irrigation pipes which allow the effluent to percolate into the surround sub soil. Drainage field should be sized from percolation test based on ground conditions, and volume of effluent to enter the soakaway based maximum population of residential property. Drainage field design can often be mistaken for simple ‘soakaway’ constructed of pits filled with rubble but drainage fields are a lot modern in design. Typical drainage field is designed to be in trench formation to allow the maximum about of surface area for the effluent to percolate into the surrounding sub soil. Usually construct with two or more sub-surface irrigation pipes to distribute the effluent evenly around the drainage field. Please be aware the correct use of materials to construct is most important for the lifespan of a drainage field. We only use slotted perforated pipework with 40 mm clean stone surround. Drainage pipework which is flexible, coiled land drainage pipework, soakaway crates for rainwater cannot be used to construct a drainage field. To calculate the size of a drainage field we would perform percolation test in the proposed location, residential property number of bedroom to work the maximum population, type of discharge from septic tank or sewage treatment plant. For sizing soakaway combination of factors are used to determine the size of the drainage field in square meters. Drainage fields serving sewage treatment plant are 20% less due to higher level of effluent quality percolating better than septic tank effluent. Consultation with the Environment Agency and local authorities to determine suitability of the site. Ground condition suitability for soakaway. Percolation test to be carried out to give accurate indication of sizing a soakaway. Land gradient suitable for soakaway and not sloping towards any watercourses. 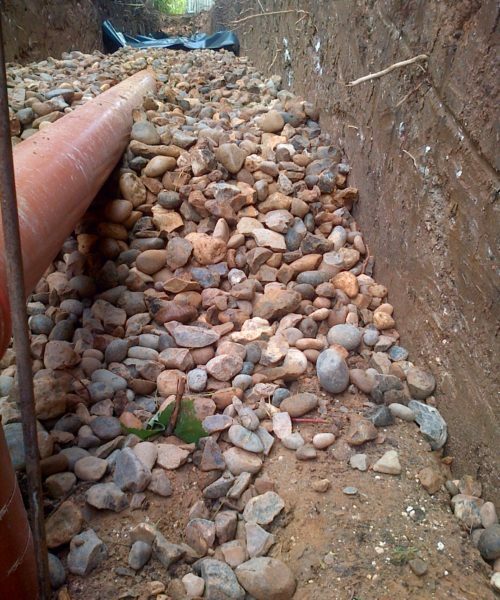 No water supply pipes or underground services located within the soakaway. No roads, drives, access roads to be located within the soakaway area. Septic tanks can only discharge to a drainage field to provide secondary treatment in the aerated layers of soil. Biological treatment occurs natural in the aerated layers of soil. The Environment Agency does not permit soakaways in prescribed groundwater source protection zone 1. Percolation test must be carried out to give accurate indication of sizing a soakaway. Good ground conditions are essential for soakaway to work efficiently. 15 meters from any building or any other soakaways. Well drained and well aerated subsoils are brown, yellow or reddish in colour. Subsoils with good percolation characteristics are sand, gravel, chalk, sandy loam, and clay loam. Ground conditions must not only be suitable in the summer but most definitely be suited for winter conditions. Poor ground conditions are often grey or blue in colour and usually indicates saturated subsoil. Examples of poor percolation characteristics are sandy clay, silty clay, and clay.